Barro is a Spanish word for mud, but for those who remember, it is much more. With Barro you can raise a home out of the earth around you. It is an ancient building technique using clay, sand, and natural fiber. 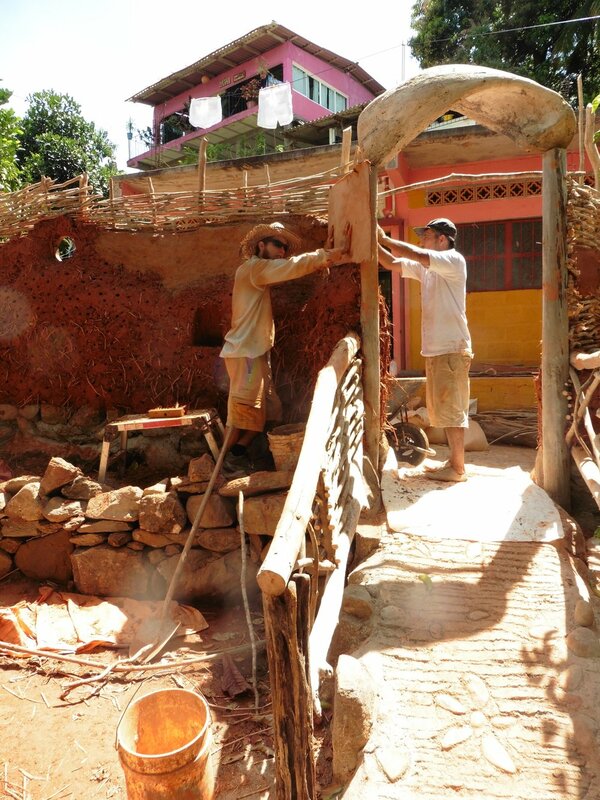 I was hired to teach this method of construction to a group of local contractors and laborers in Yelapa, Mexico last summer. Check out what we made! Why build a privacy wall from cinderblocks? I felt pretty silly as a Cascadian going to Mexico to teach the locals about cob! It is a building technique used there for thousands of years. Several people in the village I was in remembered a grandparent or great aunt who lived in a Barro home, but no one knew the mixtures, finishing techniques, or how to go about it! I did my best to remedy that, teaching my crew and anyone who stopped to look on the curious spectacle. It didn't matter what color you wore to the cobsite, everyone wore red home. The goals of my client were twofold. Create an attractive piece of art to stop foot traffic and create buzz around a beachfront rental property, and inspire a resurgence of traditional building techniques. For the locals, concrete was the name of the game. Streets, shops, houses, everything was concrete. We wanted to use beauty to remind the town that there are other ways of building. The site was directly on a main path, meaning we had a lot of explaining to do. No, it won't get washed away when it rains. No, there is no cement. Yes, it is really "just" barro! The comments we got back were quite skeptical. You don't need fluency to understand snickering. It was such a treat hearing awe and praise from those same people when the smooth coat was applied and the wall took final shape! I believe we achieved both of the client's goals. It was beautiful, and the locals were a little softer on the idea of building with mud. I kept telling my crew "just wait until we apply the base coat, their comments will flip"! I flew home after two months in Yelapa, the end of a successful project. My client wrote me a glowing review, and everyone was really impressed with the project. I have to admit I am nervous about it though. Once I left they decided to use concrete sealer instead of linseed oil for water protection, and I am worried how it will fare. But I hope it works! I will write an update once it weathers a few seasons. Overall, this project was a big lesson in terms of expectations and plans. You really cannot have too many plans in natural building. They bend and flow like the cob. But I would do it again in a heartbeat:) If you are ever in Yelapa, Mexico, go take a look at a very special wall for me. Newer PostLooking to share my shop!